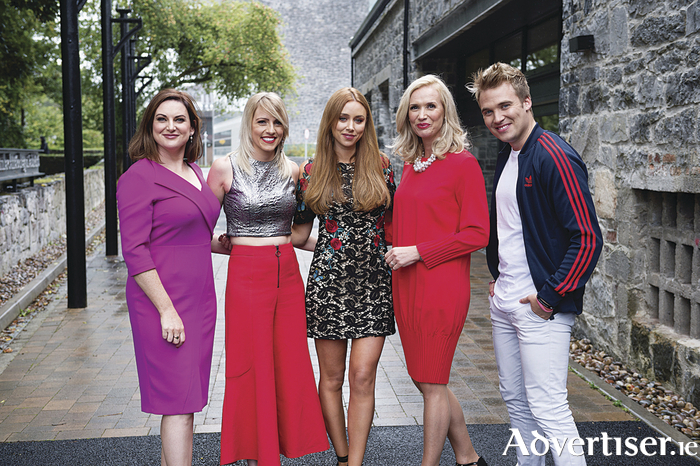 Eimear Ni Chonaola, Nuacht, Maire Treasa Ni Dhubhghaill- (Rugbai Beo) , Una Healy- Opry Dhoire, Maire Eillis Ni Fhlatharta, Ros na Run and Micheal Ciaraidh Cula 4 TG4 presenter at the Autumn launch of TG4. Photo:Andrew Downes, xposure . Energy, imagination and sharing stories lie at the heart of the programming and on-line content on offer in TG4’s Autumn line-up, revealed at a launch in the very appropriate setting of the brand-new O’Donoghue Centre for Theatre, Drama and Performance in NUI Galway this week. The energy ranges across the channel’s entire output, especially in the music, sports and kids’ output over the coming months, offering traditional country and western music, the Junior Eurovision song contest and extensive coverage of the annual Oireachtas na Gaeilge cultural festival at mid-term. The imagination permeates the extensive drama series from home and abroad, none more so than in the exciting new Cine4 initiative for new film projects in Irish which will produce feature-length works for premiere release in Irish cinemas and for later broadcast on TG4. The enduring flagship Ros na Rún series also continues to break new ground and a discerning choice of acquired series from North America and Scandinavia adds further quality to the schedule. Shared stories have been a hallmark of TG4 from the outset and it is now transitioning seamlessly to add it to new platforms. New factual TV series this Autumn tell the history of the GAA in Ulster, profile the lives of our young London-based high achievers, reveal how hurling influenced ice-hockey in Canada and highlight how an almost unknown Cork-born woman won international acclaim for her humanitarian work in two major European wars in the middle of the last century. We’ll also see how a Spanish Armada survivor chronicled life in 16th century Ireland and witness the efforts of a contemporary remote community to battle against State neglect and the ravages of emigration. There is also a mouth-watering line-up of free to view movies and a great selection of exclusive live Gaelic games, rugby and horse-racing as well as further exciting developments for TG4’s on-line offering for young people and Irish learners on the Player, the web and social media. Níos mó na Cluiche: The inside story of the GAA in Ulster and how the world’s leading amateur sports organisation grew and has prospered in that province in the most trying of circumstances. Gléasta chun Féasta: A series with a different take on fashion. Each week a team of designers, steered by hostess Bláthnaid Treacy,creates three bespoke outfits for an upcoming special event in the guest’s life. Now the guest must pick one of them ! Éire sna Nuachtscannáin: How Ireland and its people were portrayed in the cinema newsreels, mostly made by visiting UK crews, before the advent of TV here. What a nation of pixies we seemed to them. An Ríl Deal: The search resumes for Ireland’s top dance act. Tocht na Máthar: Mothers speak frankly about the about the death or life-changing injury of their child following an act of violence. GAA Beo:Exclusive live and free to view coverage of the All-Ireland Minor and Under-21 Finals, the TG4 All-Ireland Ladies Gaelic Football Finals from Croke Park on Sept 24, county finals, the AIB Club Provincial Championships and the Allianz National Leagues. Rugbaí Beo: Live free-to-view weekly coverage of the newly extended Guinness Pro 14 League competition as well as same-day highlights from Irish provinces’ matches in the European Champions Cup and Challenge Cup. Young people: The Cúla4 na nÓg zone provides a daily early-morning entertainment package for the pre-school age group. It offers brand-new Irish versions of famous animated series, introducing Masha and the Bear, Wussywat , Astroblast plus regular established favourites Dora the Explorer, Pocoyo, Dinosaur Train, Bia Linn, Saol Faoi Shráid, Igam Ogam, and Scéal an Lae. For school-going kids Cúla4 in the afternoon also has an impressive line-up, including the newly commissioned Irish language originals Whiz sa Chistin, Lurgan2K17 and Is Eolaí Mé, a fun science series. Fíorscéal: A new season of top-class international documentaries that continue to cast a thought-provoking and fearless eye on issues which affect us - environmentally, socially, politically and globally. Opry Dhoire: A new season of the popular country music performance series recorded in front of a live audience, presented by Daniel O’Donnell and co-host Lynette Fay. In an exciting cross-over element, Ireland’s top country stars duet with some well-known traditional singers. Junior Eurovision: As Ireland’s efforts in the adult section continue to falter, can our young people redeem Ireland’s reputation in this year’s Eurovision Junior Song Contest in Tbilisi, Georgia. We’ll seek and find the best young singers. Now we must find one winner to represent the country. Ireland’s former Eurovision representatives will guest-judge each programme.